‘Great Barrier Reef Stories’ is a new blog series by Killian Quigley, who is thinking literarily about the stories we’re told, and are telling, about the Reef. This first entry describes Killian’s inspiration and intent, shows how Reef stories sometimes contest one another, and examines ‘Chasing Coral,’ a tale of coralline crisis and human epiphany. By Ryan Yee via Shutterstock. Stock photo ID: 732636385. Stories matter. They tell us what has happened, they suggest what can happen, and they predict what will happen. They train our attention to specific characters, settings, and incidents. They imply relationships: among events and consequences, characters and communities, behaviours and moral precepts. They issue from certain tellers, and direct themselves at certain audiences. I’m not only referring to literature, or whatever you call the results of deliberately artful composition. We all tell stories, all the time, and when we do so, we do more than enumerate facts. We remember, imagine, and describe. We organise particular pieces of information toward particular ends, ends informed by personal impulses as well as external pressures. The details we select, and the structures we erect, indicate not only our senses of the outside world, but of our own histories, communities, and identities. Pay special attention, next time you’re asked where you’re from, or what you do: in responding, what do you include, and what do you leave out? What general impression do you aim – consciously or unconsciously – to communicate to your hearer, and why? The Great Barrier Reef is not dead. That’s a story – or the premise of one, or a counter-narrative to one. One of the people telling it is Andy Ridley, CEO of Citizens of the Great Barrier Reef, an incipient organisation – it doesn’t really kick off ‘til next month – devoted, in large part, to resisting the “story that our reef is no longer salvageable.” I met Andy last weekend in Mission Beach, Queensland, where we were among those celebrating the fiftieth anniversary of a successful grassroots campaign to protect nearby Ellison Reef from mining. (In my colleague Iain McCalman’s account, that campaign proved the fruitful germ of the establishment of the Great Barrier Reef Marine Park, and of its designation as a UNESCO World Heritage site.) Before the event, I’d never heard of Citizens, but as I met and chatted with fellow celebrants, its name – and Andy’s – kept coming up. It became clear to me, from those conversations and from the day’s many other rich exchanges, that there’s a great deal of concern for what stories get told about the Great Barrier Reef, and what stories we’d do well to tell. As a teacher, scholar, and student of literature, I spend a lot of time reading, pondering, and writing about stories. I returned from Mission Beach feeling that I should apply what skills and knowledge I’ve got to exploring narratives about the Reef – to examining what forms they take, to considering what identities and communities they conjure, and even, ultimately, to charting new tales. So I’m going use this space to familiarise myself – and, if you’ll join me, yourselves – with significant Reef stories, and to get a grip on how those stories operate. Think of this as a slightly unusual – and sustained – exercise in close reading. If that sounds dryly analytical, I promise that it needn’t be – I promise, to the contrary, that it can be thrilling, if it succeeds in illuminating aspects of story that we don’t ordinarily notice. What I won’t be doing is serving as a thoughtless mouthpiece for those stories; nor, for that matter, will I be out to tear them down. These will be experiments – essays, in the traditional sense of that word – investigating and comparing diverse Reef stories, and for them to succeed, I’ll need your help (more on this in a bit). Best to begin with an example – with a story. It’s a fair and fêted one, which I caught this week at a Sydney Ideas event here on campus. Chasing Coral premiered on Netflix in July, after winning the Audience Award for U.S. Documentary at the 2017 Sundance Film Festival, in Utah. It’s a tale of coralline crisis, in a time of rapidly warming and acidifying oceans, and a tale of ardent efforts to visualise – and so raise awareness of – that crisis. Its cinematographic techniques are breathtakingly effective, whether capturing the creeping horror of deteriorating coral beds or the chromatic splendour of healthy reefs. 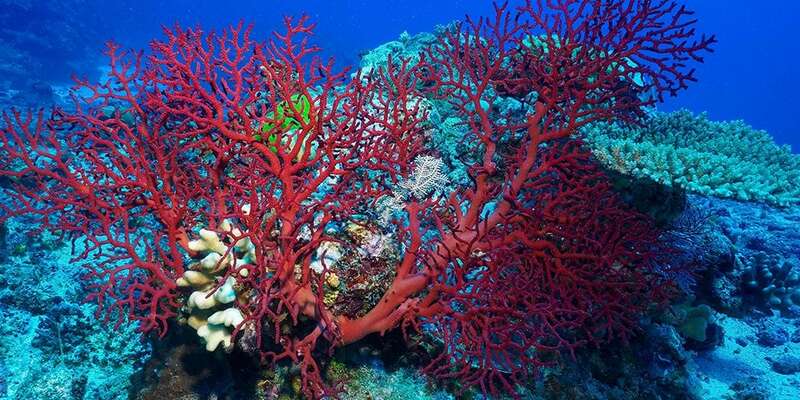 Most spectacular, perhaps, are its achievements in rendering coral animate – in making its polyps move, and thus making it lively. (Queensland’s own BioQuest Studios was instrumental in delivering such scenes; you can see some examples of their work here.) The film’s efforts to this end prompt some challenging ideas: are we so narrow-minded about life that we need things to move around to be convinced they aren’t dead? What other evidence would we be willing to credit? And what sorts of emotion do we require in order to empathise with lives unlike our own? Must we empathise in order to care? Importantly, Chasing Coral is also a story of human epiphanies. Two in particular stand out. Erstwhile adperson Richard Vevers recalls being thunderstruck into awareness of the plight of the world’s reefs and sharing his revelation – and reformation – with Jeff Orlowski, who would direct and co-produce Chasing Coral. In one memorable scene, Ruth Gates, of the Hawai’i Institute of Marine Biology, explains the nature of the coral animal to a stunned Vevers. His transformation charts an occupational and ethical trajectory, from conversing trivially about marketing toilet-paper to founding The Ocean Agency. This is Vevers on the path to enlightenment, and the movie’s made in such a way as to make its audience feel that they’re travelling along with him. For about the second half of the film, its characterological centre shifts, from Vevers to Zackery Rago, a young technician and aquarist. It is Rago’s emotional response to the travails of documenting coral bleaching, and above all to the bleaching itself, that drives the documentary, and its audience’s experience, toward the finish. By showing us the intellectual and sentimental formation of its protagonists, Chasing Coral invokes the literary tradition of the bildungsroman, or novel of education, exemplified by works like Goethe’s Wilhelm Meisters Lehrjahre (1795-6), Dickens’s David Copperfield (1849-50), and D. H. Lawrence’s Sons and Lovers. Distant relations, perhaps, but significant ones: acknowledging them helps us understand how narratives like Chasing Coral work, and how they relate to us as their audiences. On their website, the filmmakers quote Ove Hoegh-Guldberg, of the Global Change Institute at the University of Queensland: “It’s not too late,” they cite him as saying. “It’s still possible to reduce the rate at which the climate is changing, and that’s within our power today.” It’s worth noticing how Chasing Coral communicates its messages, and how its modes of storytelling relate to those messages. Doing so empowers us: as watchers, as thinkers, and as citizens. Killian Quigley is Postdoctoral Research Fellow at SEI. Share your impressions of these stories – and of others – with him at killian.quigley@sydney.edu.au. Be sure to check out the panel discussion that followed the Sydney Ideas screening – it features Profs. Maria Byrne, Jody Webster, Iain McCalman, and Ana Vila-Concejo. And for an expert view of environmental narratives, I recommend the work of Ursula Heise – check out this episode of the Generation Anthropocene podcast.